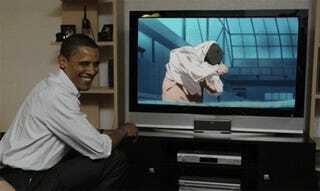 Earlier this week our own Brian Ashcraft celebrated the President-Obama-loves-anime meme. Now we elevate it. Surely you saw this coming. You might not have imagined I would splash a slightly modified version of justaskkeikaku's animated GIF, but the signs were all there. See? Even codexcdm got it. He's probably got twenty images of Obama mixed with anime already. You guys have a lot of catching up to do. The rules are simple—demonstrate how big a fan of anime my country's leader is by combining visual images. Do try to keep it clean and in good fun, as the Secret Service is poised to tackle any one of us at a moment's notice. And do try to get your entries in by Saturday. The President is a busy man.